These versatile halls will make your wedding extra beautiful. (SPOT.ph) Hotel ballrooms and courtyards are convention for weddings, but event venues are much more versatile when it comes to accommodating different motifs and themes. Here are 10 wedding venues that not only allow couples to celebrate their big day their way, but also set the perfect mood with their streamlined architecture, elegant interiors, and comprehensive amenities. The venues are listed in random order. Note: Rates may change without prior notice and may vary during peak and non-peak seasons. Located in McKinley Hill in Fort Bonifacio, The Blue Leaf Pavilion houses three halls in varying sizes, all suitable for couples looking for an elegant urban setting for their reception. Each hall is equipped with its own private room and bathroom. 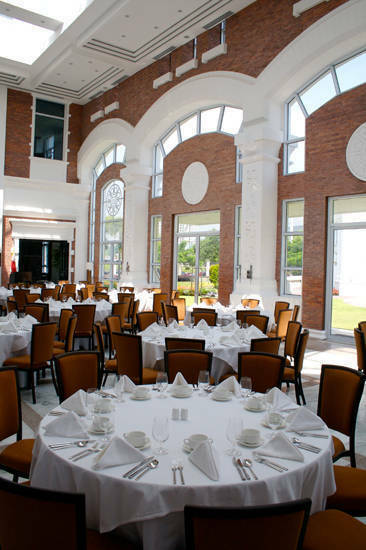 Banyan can accommodate 300 guests, while Jade has ample space for 150 to 200 guests. The two may also be combined for bigger celebrations. The Silk Hall, on the other hand, can fit 250 people. The Blue Leaf reservations include use of LCD projector, screen, and stage. 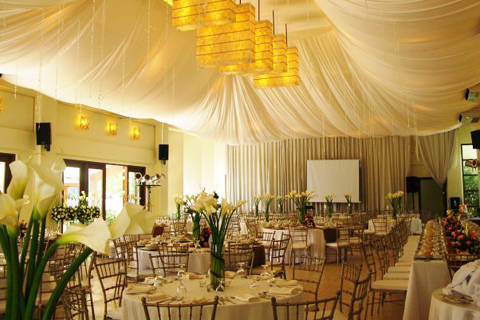 They have wedding packages bundled with catering services that start at P300,000. 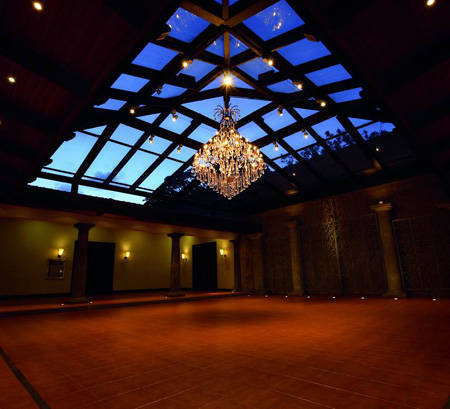 As their name suggests, this events hall is a blank canvas for different kinds of celebrations. White Space is ideal for weddings with a contemporary or minimalist theme. The white-washed walls give couples a chance to dress up the space however they want to. It also offers wedding packages, which include catering services from Cibo, Bizu, and Albergus Catering. (The Cibo di M commisary is located here). The use of White Space is priced at P156,800. Tel. No. 234-0502 or 451-2517 or visit their website for more information. Located in a new residential and commercial complex in Alabang, the Versailles Palace gives couples that look of luxury in the city. It features sophisticated French architecture and interiors, reminiscent of the world-renowned Palace of Versailles in France. 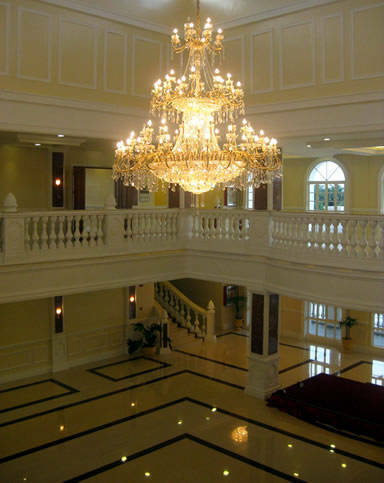 Its clubhouse has a grand ballroom, which boasts of a high ceiling, a giant crystal chandelier, and large windows for that royal effect. Couples who dream of a chic French wedding will find that coming true in the Versailles Palace. What’s more, they have Spanish- and French- themed parks perfect for photo-ops. The Versailles Palace's Grand Ballroom can fit 500 guests. 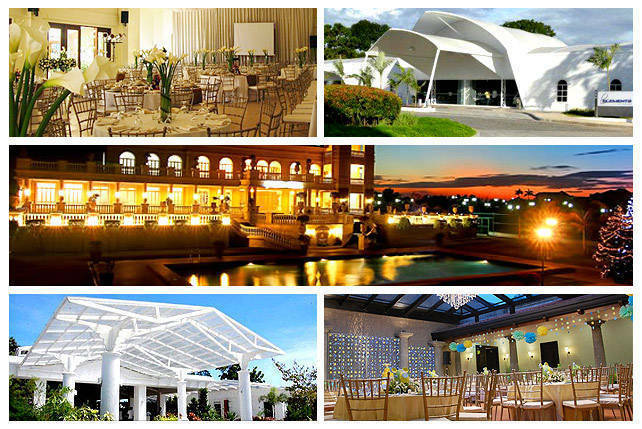 Rental fee for daytime weddings is P50,000, while evening affairs are charged with a P70,000 rental fee. Additional charges apply. Nestled inside the popular culinary school is an elegant indoor events space blessed with a charming view of a garden courtyard. The Atrium features a glass ceiling, lofty windows, red brick walls, and marbled floors. Whatever time of day your reception is, The Atrium, which has a capacity of 150 people, presents an ideal space for intimate affairs. The Atrium may be rented for P25,000, and comes with a P175,000 consumable rate for food and beverages. Enderun also has a bigger venue, The Tent. Couples may also choose their menu setup. Buffets are priced P1,150 to P1,750/person with a minimum of 30 guests, while set menus range from P1,100 to P2,350/person. Enderun offers carving and live cooking stations, as well. Located in a commercial district in the northern part of Quezon City, Elements at Centris presents a pair of tented spaces ideal for festive affairs. The sleek white tents present couples with a contemporary space, which is also easy to dress up according to whatever kind of theme. They also have suites within the complex, which allows couples to freshen up prior to their reception. Each tent hall can accommodate 350 people. For grander celebrations, couples may use both halls to provide enough space for a party with around 700 guests. Renting Elements will set you back P75,000 for four hours. Located on the 38th floor of The Manansala in Rockwell, Makati, The Loft presents couples with a simple, sophisticated space, letting the breathtaking view of the city serve as the only embellishment. With a high ceiling and floor-to-ceiling glass walls, The Loft is a fitting choice for couples who wish to have a more modern celebration. The venue can accommodate around 300 people. The P80,000 fee comes with basic lights and sounds, stage, parking space, and a one-night stay at Manansala for the couple. The new Blue Leaf ASEANA offers marrying couples a contemporary Filipiniana space that can work for either grand or intimate receptions. The expanse features a modern garden complex with elegant lounge areas, spacious halls and function rooms, and neat wooden elements. It’s a beautiful backdrop for wedding photos. Located in Aseana City in Paranaque, The Blue Leaf Filipinas houses different halls named after local festivals and customs. The biggest hall, Sinulog, can accommodate 500 guests, while Pahiyas and Pintados can accommodate 300 and 200 guests, respectively. Each hall has its own lounge and bathroom for couples who want to freshen up before the celebrations. All three halls may be combined for bigger parties (up to 1,000 guests). More intimate gatherings will find the Harana, Kundiman, and Cariñosa rooms a perfect fit. 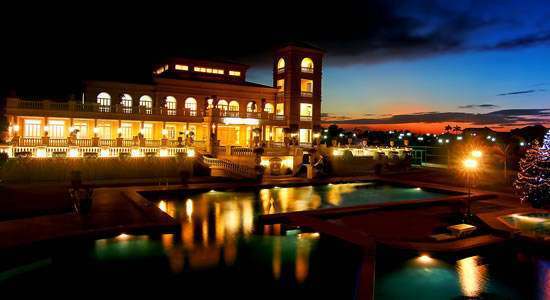 All three offer a breathtaking view of the complex's garden. 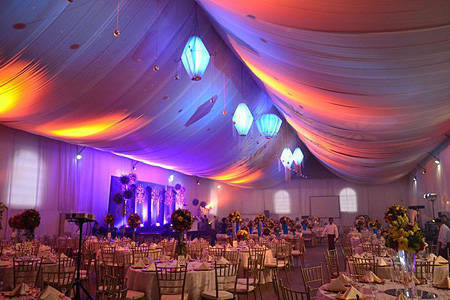 Rental rates for their event halls range from P100,000 to P500,000. If you fancy a charming garden setting for your wedding, you can opt for Light of Love in Quezon City. The garden complex houses seven different venues, which range from intimate halls to sprawling outdoor spaces-each offering a different way for guests to enjoy Light of Love's whimsical gardenscape. The Atrium, which can accommodate 180 guests, features a glass ceiling, making it ideal for evening affairs as it presents a dreamy view of the night sky. They also have tented spaces, Loyalty and Trust, which are perfect for celebrations with 300 to 400 guests. 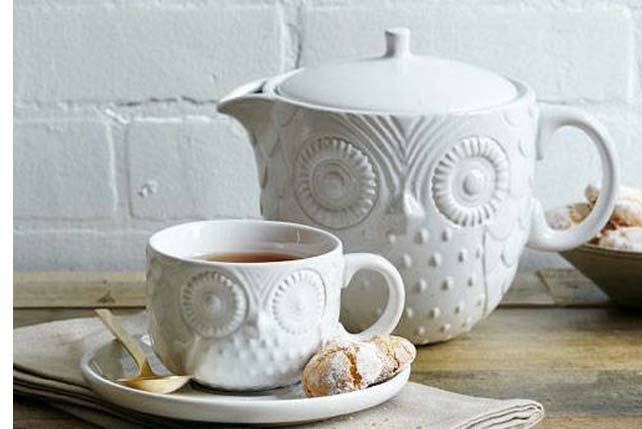 Love and Integrity, on the other hand, are indoor spaces apt for more intimate gatherings. Cherish and The Garden both boast lush tree canopies, which add a whimsical character to love-filled events. 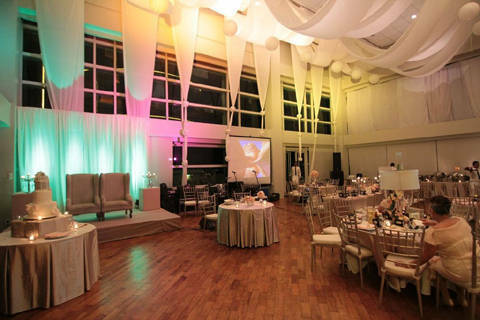 Rental fee for any Light of Love events space ranges from P62,000 to P80,000. Located along Roxas Boulevard in Manila, Palacio de Maynila displays a gorgeous view of Manila Bay to complement any romantic celebration. 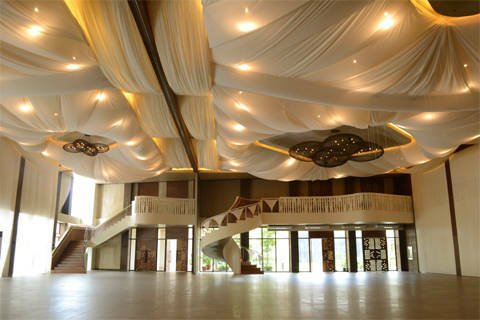 The venue features a draped high ceiling, which gives the space added elegance. 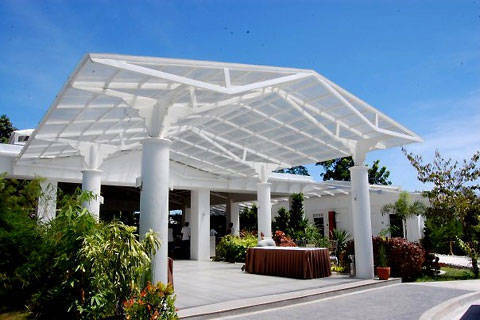 Palacio de Maynila accommodates 150 to 600 guests. Their venue rental rates range from P123,200 to P134,400. They offer catering tie-ups, as well. This glass-walled pavilion gifts guests the splendor of the outdoors with the comfort of being indoors. Sitio Elena features a well-manicured garden that surrounds a contemporary pavilion. 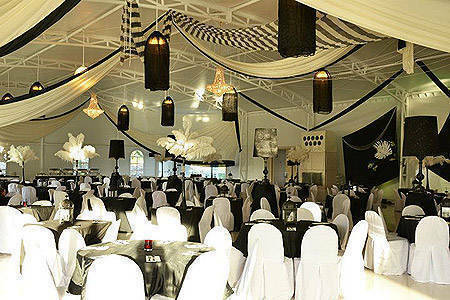 The pavilion can accommodate up to 500 guests, may be styled for either intimate and grand events. Their wedding packages feature extensive inclusions, such as buffet catering services, use of amenities, lights and sounds system, use of bridal car, and other wedding party needs. 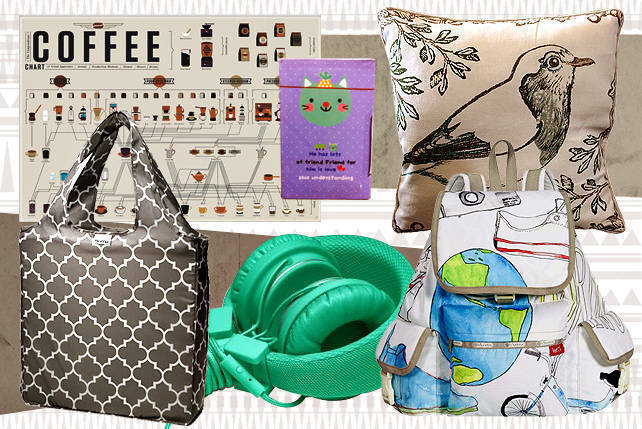 Their packages range from P220,000 to P250,000, depending on the time of the event. Photos courtesy of BridalBook.ph (The Blue Leaf Pavilion, The Blue Leaf Filipinas, Sitio Elena), Toto Villaruel (The Loft), Facebook (Whitespace, Elements), and from their respective websites.